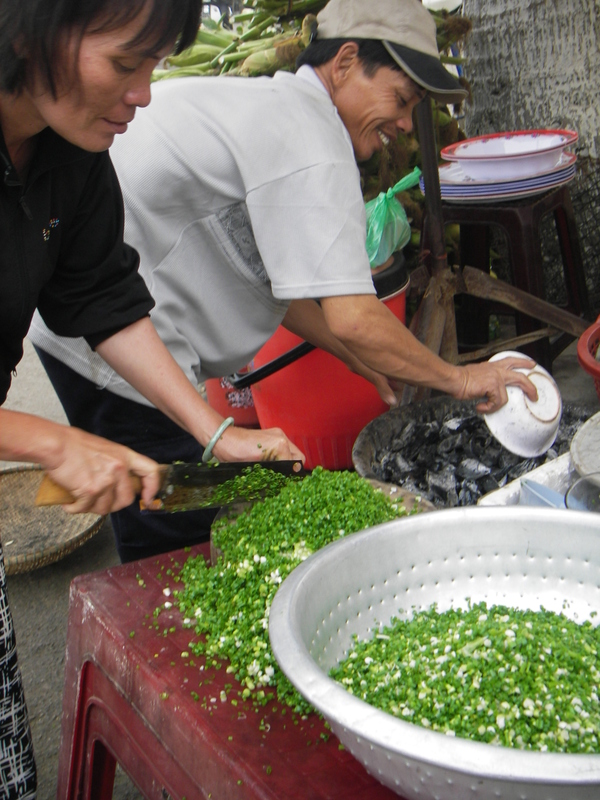 On the street corner of Hoi An, sliced scallion is soon ready for making into scallion oil. The most memorable time for me in Hoi An was getting up to see the sunrise over the Bon River while drinking Vietnamese coffee shortly before heading for the market. Then I walked along the street, and the scenery was very beautiful. The aromas and sounds were so enlivening and the taste of the food was phenomenal. I tasted many street foods along the streets and took a lot of it back to the hotel so that I could taste more during the day. This is part of the learning, culture and cuisine. Now, as I look at all my photos, I am getting hungry from the taste of foods that I still remember and long for. I came to love one particularly famous grilled corn dish in Hoi An, Mo Hanh. It is made of grilled corn with scallion oil. 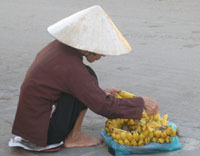 You will see pictures of why the Vietnamese are so fond of this dish by the amount of corn on the street of Hoi An. Yesterday, I was grilling corn for a special event at Magnuson Park in Seattle. About 500 people were there. 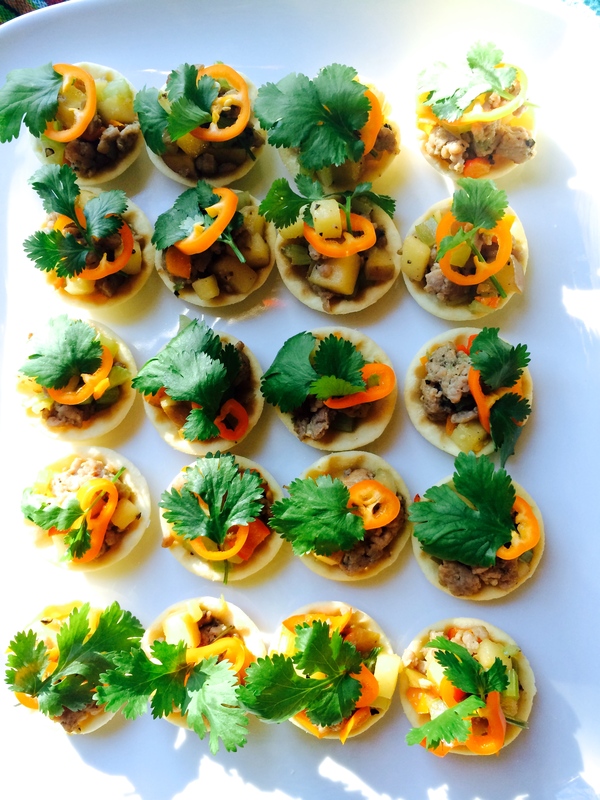 I have 3 flavors for them to choose from: with spicy coconut sauce, jalapeno sweet and sour sauce and scallion oil. They were all a big hit at the event. I am delighted to share grilled corn with scallion oil recipe with you and hope that you will get a chance to enjoy until the last harvest of local fresh corn. To make scallion oil or Mo Hanh, heat canola oil until very hot and drop in green and let it cook for 40 seconds. Stir in salt. Let it sit until cool. Keep well in refrigerator for a week. Grill corns over high heat 6 to 8 minutes, until some pope with nice brown cornel. When serve, dip each ear in scallion oil. Enjoy while it is warm. Finally the right recipe for scallion oil (in vietnamese we call it Mo Hanh). I have been searching long online for the correct one…everyone else seems to have omitted the sugar. Thank you! We actually took notes how street vender in Hanoi cooked on the street. It was so good. A little touch of sweet go a long way to balancing the right flavor. Thank you for Vietnamese word for the dish.